Intel's NUCs have managed to develop a strong market for ultra-compact form-factor (UCFF) machines since they were introduced in the early 2010s. Each CPU generation has seen Intel put out stronger versions of the NUC (both in terms of performance and features) in a regular cadence. In parallel, we have seen experiments with slightly larger form-factors (such as the Skull Canyon and Hades Canyon NUCs). Currently, Intel has NUC platforms targeting three different market segments – the entry-level, mid-range, and enthusiast. 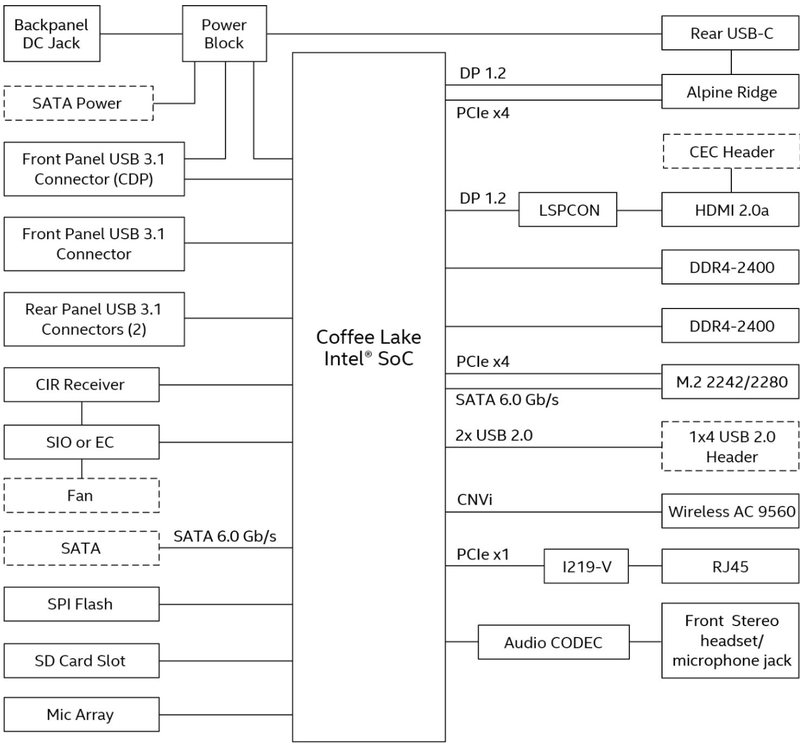 While the entry level is served by Atom-class SoCs and the enthusiast category by H-/G-series CPUs, the mid-range is served by the U-series SiPs (system in package) that use the Core microarchitecture. Today, we are looking at Intel's latest flagship in the mid-range segment – the Core i7-based Bean Canyon (NUC8i7BEH). 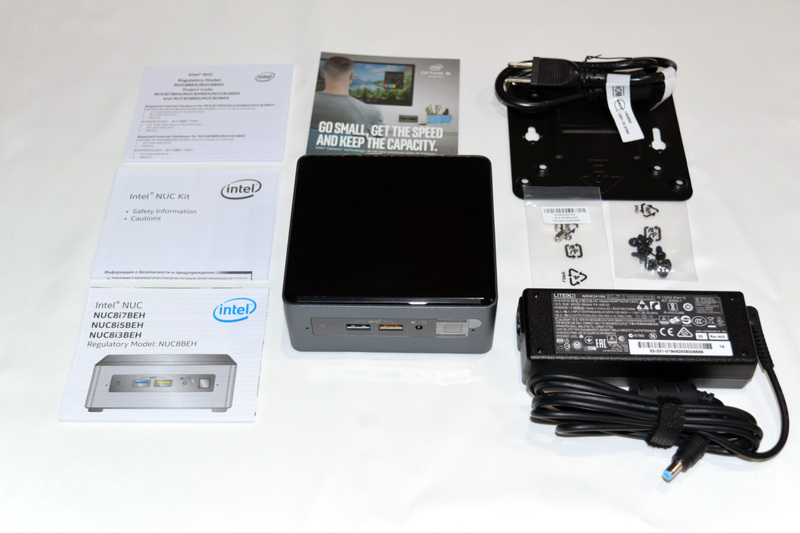 The Intel NUC8i7BEH (Bean Canyon) kit comes with a quick-start guide, hardware for VESA mounting, bunch of screws for installing the storage drives, and a 0 W (19V @ 4.74A) adapter with a US power cord. The integrated PCH enables four USB 3.1 Gen 2 ports that are present as Type-A ports in the front and rear of the chassis. CFL-U also supports CNVi, the new 'integrated connectivity' feature that puts the Wi-Fi and Bluetooth MAC inside the PCH. In the NUC8i7BEH, the CRF (companion RF) module completes the Wireless-AC 9560 by implementing the signal processing, RF, and analog functions. The Intel Wireless-AC 9560 is a significant upgrade over the Wireless-AC 8265 in the Kaby Lake NUCs. It comes with Wave 2 features, including support for 0 MHz channels and downlink MU-MIMO. The 2×2 WLAN module is theoretically capable of 1.73 Gbps bandwidth. It also integrates dual-mode Bluetooth 5 support.